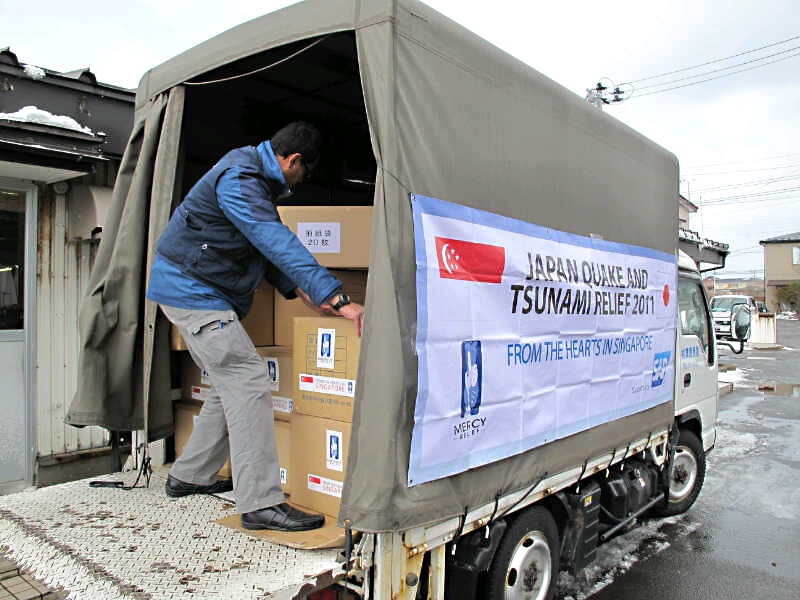 Mercy Relief’s (MR) preliminary 2-man team to Japan has established the logistics supply network in the northern part of quake and tsunami-affected areas near Iwate. Operating amidst sub-zero temperatures, the team is now able to procure much-needed relief supplies from several unaffected neighbouring prefectures and transporting them to the various shelter centres holding the survivors who have been evacuated from the disaster affected areas. MR’s initial tranche of relief supplies comprising blankets, water and food, amounts to USD50,000. A second relief team has been deployed today to bolster its aid efforts there. Working with the local governmental and non-governmental agencies and the business community there, MR’s operational objective remains focused towards supporting the stabilization of the ongoing crisis i.e. addressing the essential needs of the affected communities and reducing the risk of exposure to natural elements such as the falling snow and dipping temperatures. MR is currently serving the affected areas which are a safe distance outside the radiation-hazard zone (officially 30km radius of the nuclear reactors’ location). In order to facilitate and ensure the team’s safety and quick evacuation, if necessary, a dedicated unit at the MR Headquarters in Singapore is monitoring the radiation alerts and advice from the Japanese Government and the International Atomic Energy Agency (IAEA). Mercy Relief staff loading relief supplies in sub-zero temperatures near Iwate. With more than 20 companies, institutions and public coming forward to raise funds or offer in-kind services to support MR’s logistical operations, MR has stepped up its fundraising and donor management efforts by issuing authorization letters to their various fundraising partners. Apart from contributing monetary donations, companies have also offered to help MR publicize its aid efforts via social, digital telecoms mediums and physical and online retail channels. Focus Media Singapore –donation appeal campaign via Focus Media’s digital Out-of-Home media network deployed at over 280 premium office & commercial buildings in the prime business districts of Singapore, at Watsons personal care chain-stores and at all HDB shopping centers island-wide. Donations from the public will be used to address the most pressing basic needs including food, water and blankets which will be procured on the ground and dispatched from MR’s ready stockpile.